This is a big week for magic in Sheffield! As well as the David Stone lecture here at the Lounge on Thursday, on the night before you have the rare opportunity to see performances by three of Sheffield’s leading exponents of the darker side of magic. Roger Curzon, Mark Lund and Ashton Carter will be strutting their edgy, mysterious stuff at the Fat Cat on Wednesday 21 November. Tickets are £7 and available from goatboyreadsminds@mail.com. 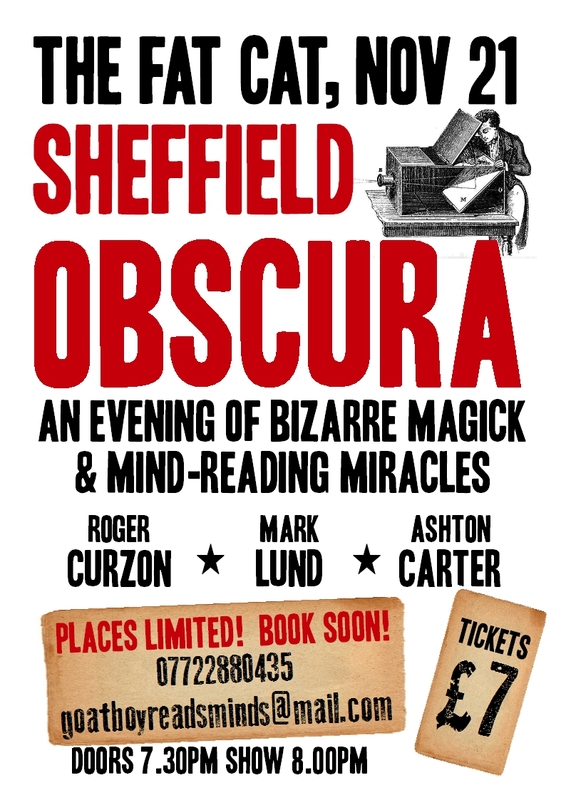 So if you fancy an evening of bizarre magick and mind-reading miracles, get yourself booked. Doors creak slowly open at 7.30 p.m. and the show lurches into life at 8.00 p.m.